1944 It all started back in 1944 when Grant and Sheila Purdy opened a simple watch makers shop. 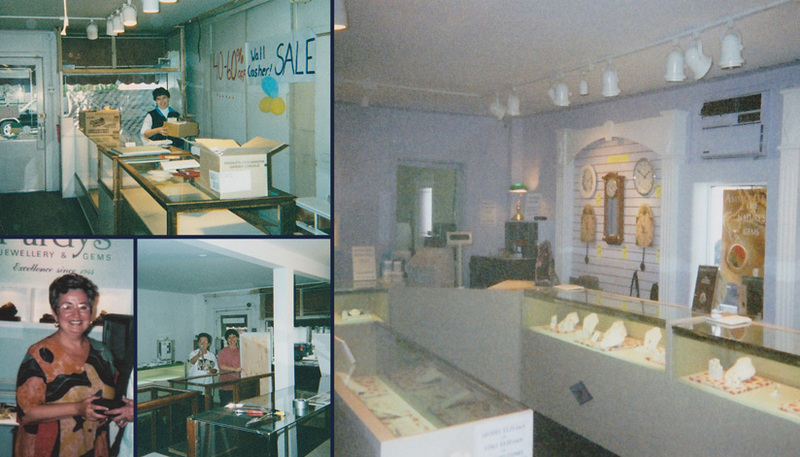 It was a small shop located in just a portion of the existing Purdys Jewellerys store situated on Bolton St. in Bobcaygeon, Ontario. In this picture you can see Uncle Grant working away at his work bench, the same bench that we still use today! Although times and technology have changed, we still stand by the high level of care and workmanship that Grant established. 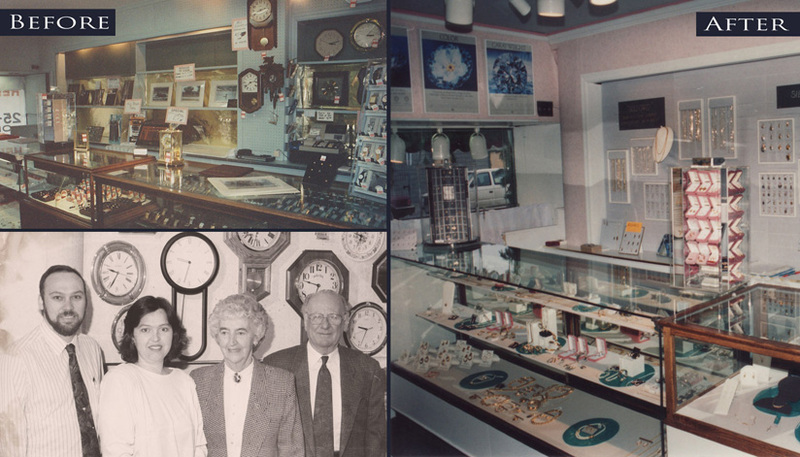 1945-1985 Through the years, Grant and Sheila saw their store grow from a watchmakers shop to a fully stocked jewellery store including jewellery, clocks and giftware until their retirement in 1985. 1975 For five years, Sheila and Grant hired their niece, Marylynn Junkin, who worked for them as a student. 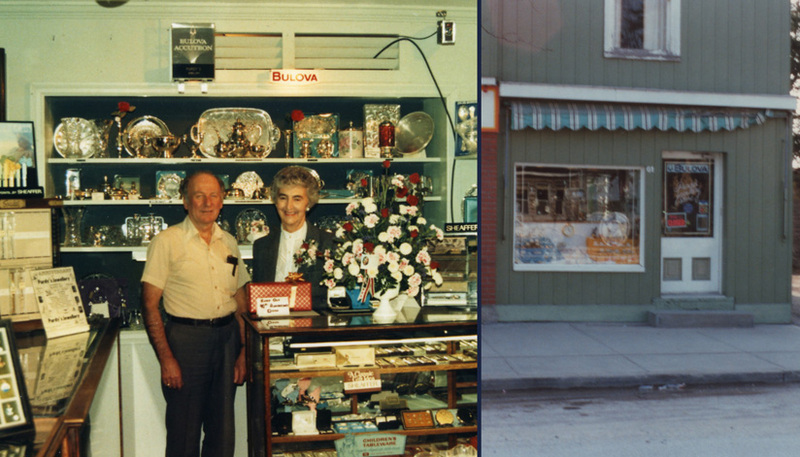 1985 After 41 successful years in business, Sheila and Grant Purdy decided it was time to retire. In September of that year, their niece Marylynn and husband David Lindsay purchased the business. 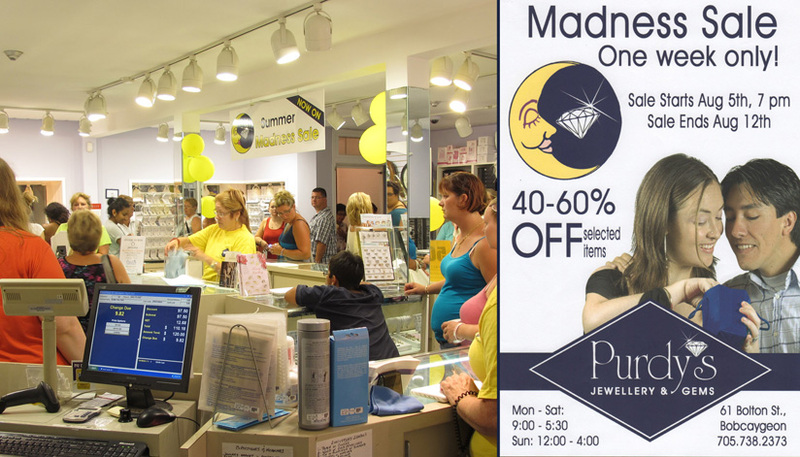 Marylynn and Dave continue today to own and operate Purdys Jewellery and Gems. 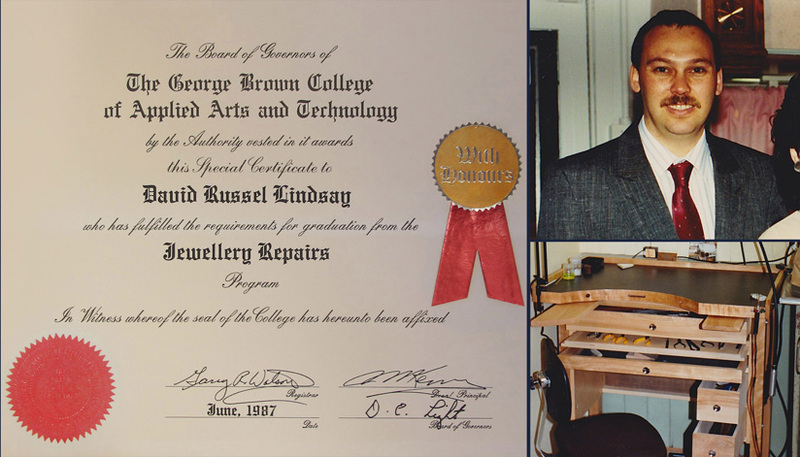 Dave Lindsay graduated from George Brown College with honours in Jewellery Repair. Debbie Lance joined our Purdys sales team. 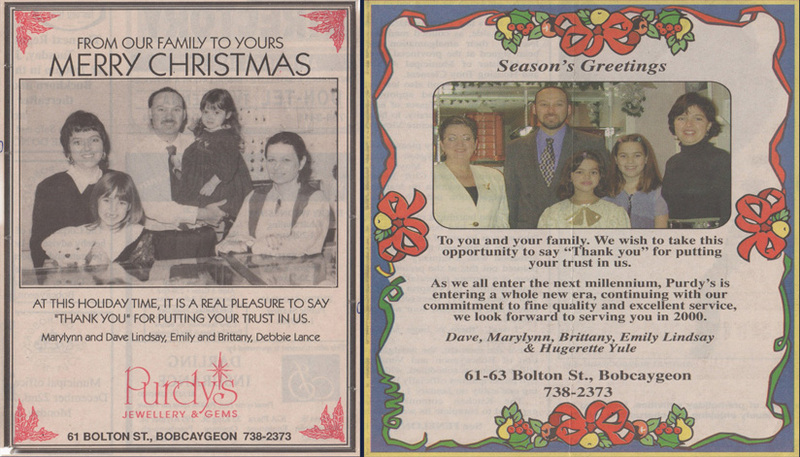 1988 One of our traditions at Purdys Jewellery was putting a Christmas greeting in the local paper, thanking all of our wonderful customers for the patronage they had given us. 1989 In 1989, Purdys underwent a facelift. The store was completely renovated; giftware was eliminated freeing up space to specialize in jewellery, watches, and clocks. Sheila and Grant Purdy are pictured with Dave and Marylynn Lindsay. 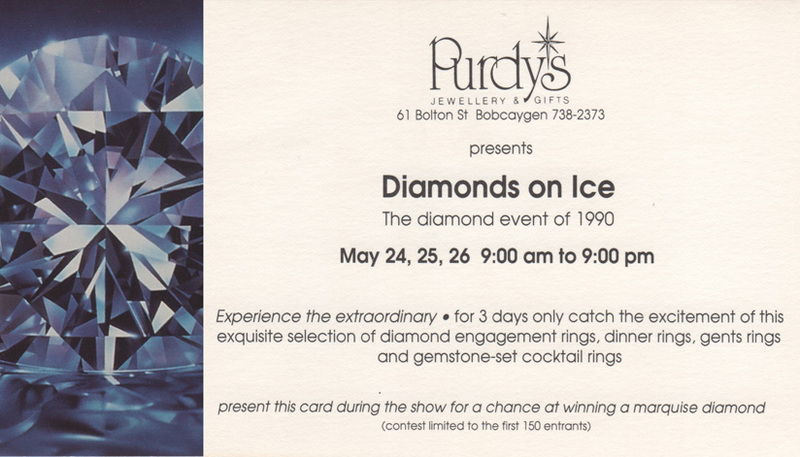 Our 3-day Diamonds on Ice promotion in the spring of 1990 was a fun, interactive event where people tried on various diamond pieces and learned about the different diamond qualities. During the event, customers could choose one ice cube from a large chest of ice cubes in hopes of choosing the special one that had a diamond frozen inside. The lucky winner won a .25 carat diamond! 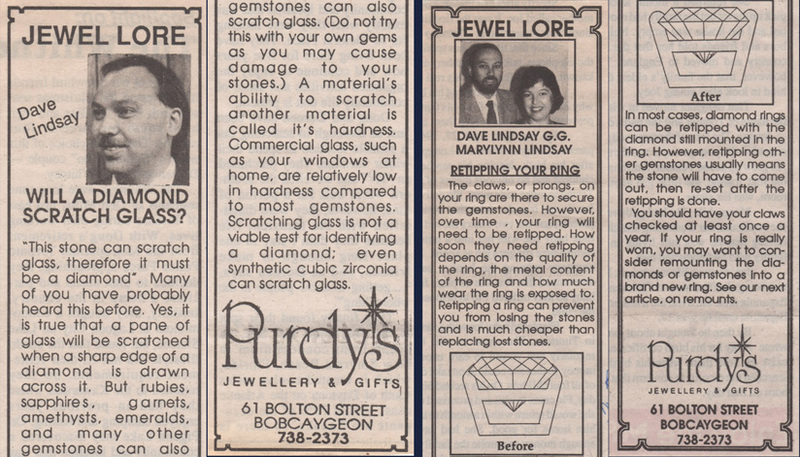 Purdys first publication of Jewel Lore was in May of 1990. Dave started this column in the Bobcaygeon Independent newspaper to bring the knowledge of gems and jewellery history, facts, and folklore to the local community. Dave and Marylynn continued to publish the popular column together for the next few years. 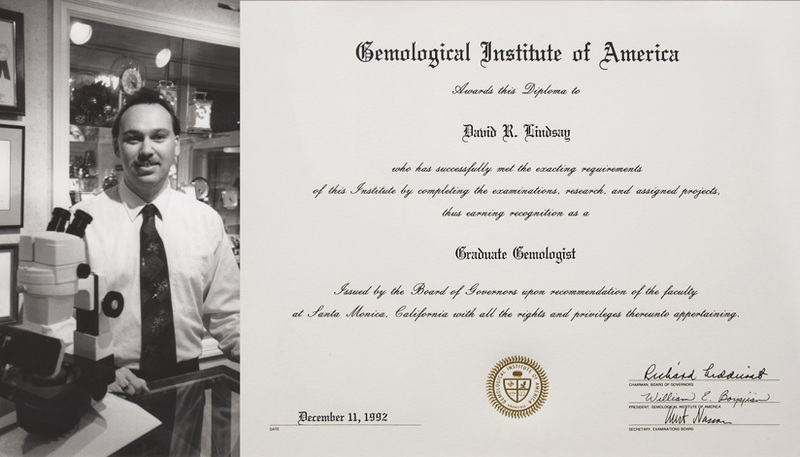 1992 Dave Lindsay graduated from GIA (Gemological Institute of America) receiving his Graduate Gemologist Diploma which is recognized by professional jewellers and gemologists as the standard of excellence. 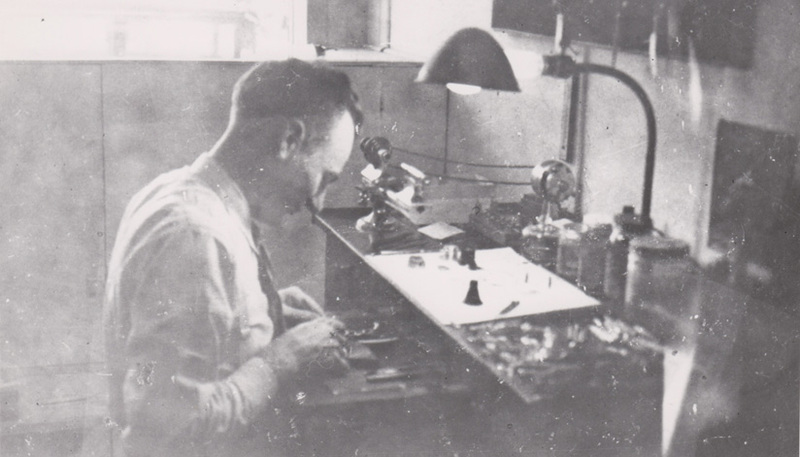 With his newfound knowledge and prestigious title of David R. Lindsay G.G, he began his career as Purdys in-house gemmologist analyzing, testing, and grading precious gems. 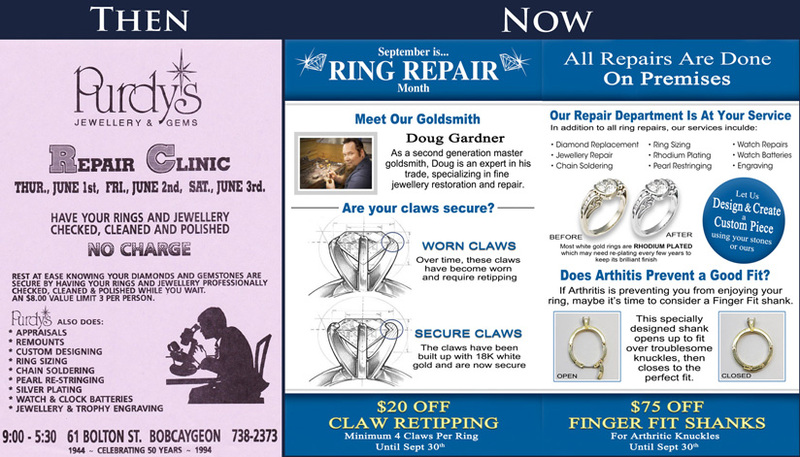 Since 1994, Purdys Jewellery and Gems have hosted an annual Repair Clinic. Initially, it started as a 3 day event reminding people to have their rings and jewellery checked for worn claws and other repairs. Over the years, the annual event has become so popular that it now held for the entire month of September! During the event, we offer to inspect your rings and jewellery, advise you of the overall condition of your piece and recommend any repairs that should be done; allowing you to continue to wear your rings and jewellery with piece of mind. With the use of a camera, we are able to show you your ring enlarged on a computer screen and can point out the areas that need attention. We offer specials on ring repairs and complimentary ring clean and polishing. 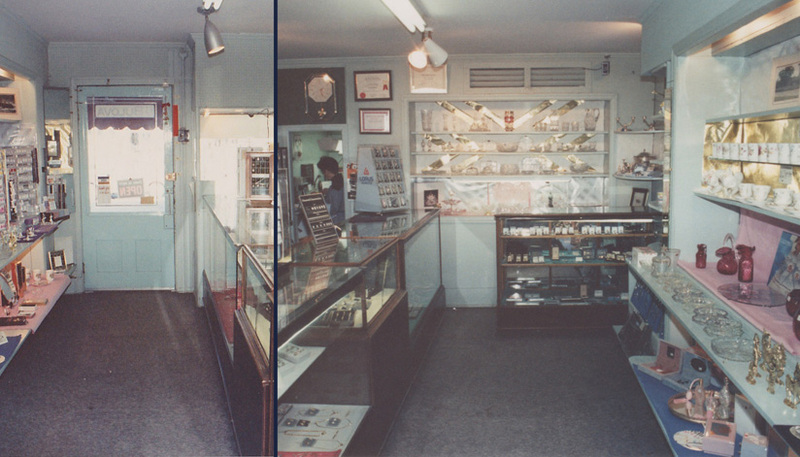 November 1994 marked the 50th anniversary of Purdys Jewellery and Gems. To celebrate, we held a special 3-day event. There were 5 diamonds given away, a door prize for every person who came, and delicious fine wine and cheeses! Sheila Purdy was an honoured guest. A lot of changes happened in the millennial year for Purdys. Business was growing and so was our need for space. 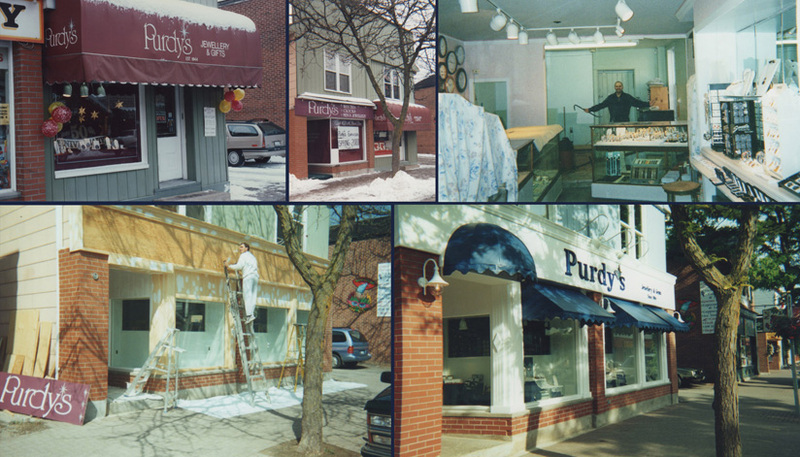 Thus in 2000, Purdys acquired the adjacent store space, formerly occupied by Norms Variety, and expanded our store to the size it is today. This gave us two and a half times the interior space which allowed for more diamond, gemstone, and jewellery inventory. We also created an extensive Gem Lab. With his newly established lab, Dave Lindsay was able to do on-site jewellery appraisals. 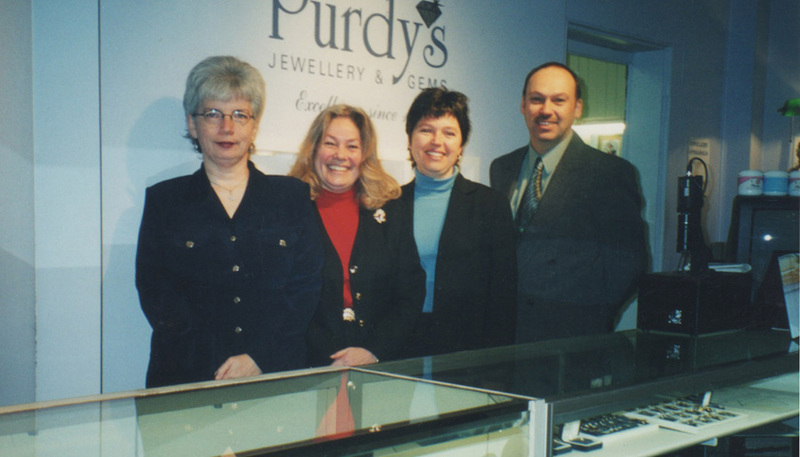 It remains to this day that Purdys has the only on-site jewellery appraiser in the Kawarthas. 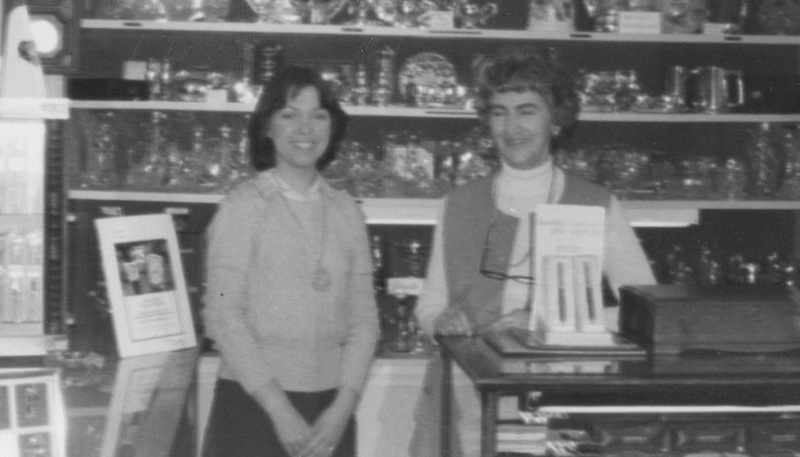 Marylynn and Huguette Yule (who joined our sales team in 1997) can be seen here working on the interior of the store. 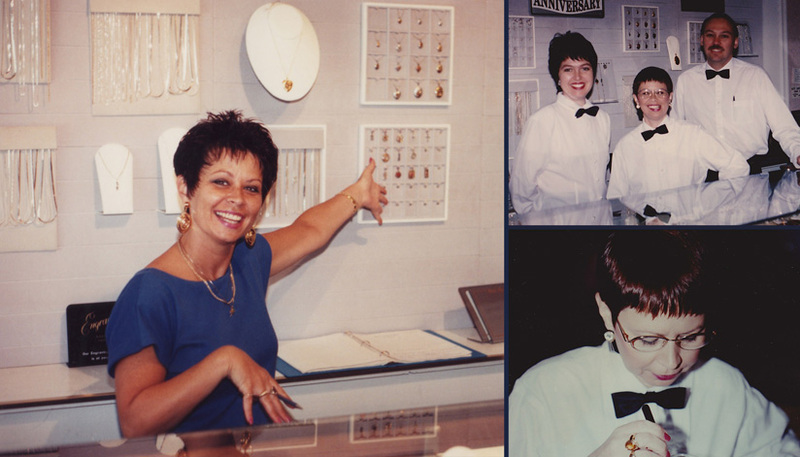 2001 Our sales team grew to include Lorelei Franklin (Wright) and Linda Rivers, both of whom have stayed with us throughout the years. 2003 Dave Lindsay, G.G. 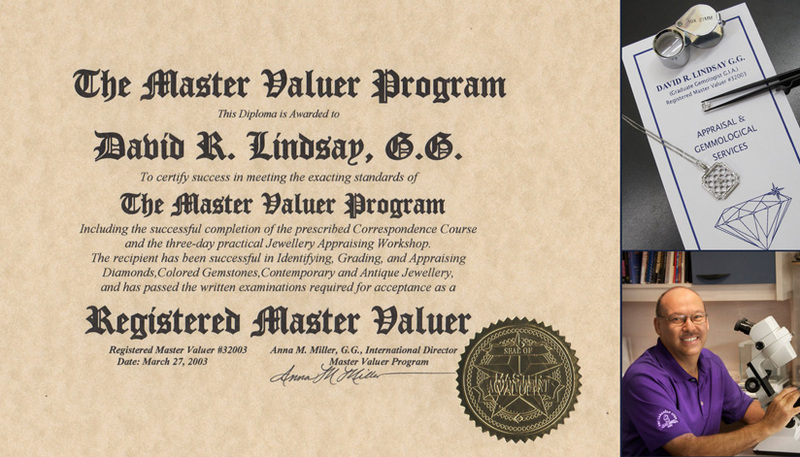 became a Registered Master Valuer after completing his study of Appraisal Theory in the Master Valuer Program. 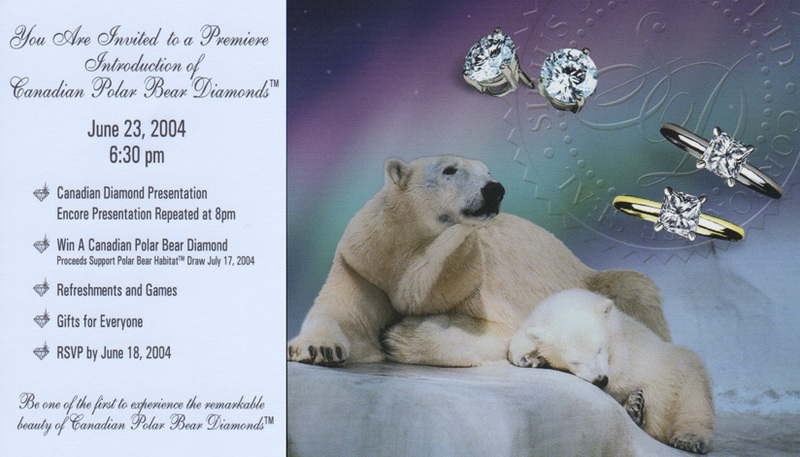 The year of the polar bear, for us at least, was in 2004 when we introduced our new brand of Polar Bear Diamonds. They were the very first diamonds mined in Canada, the first diamonds that were branded by name and the first diamonds to be laser inscribed on the girdle. Each Canadian Polar Bear Diamonds inscription included a Polar Bear logo and the Northwest Territories Certificate of Authenticity number (only visible with the use of a microscope). During our launch party, we had a draw to win a .30 carat ideal cut Polar Bear diamond. Those who entered the month-long draw were given the opportunity to make a voluntary donation to the Polar Bear Habitat Rescue and Rehab facility in Cochrane, Ont. In total we raised over $350 for their polar bear conservation program. Although Polar Bear Diamonds are currently out of production, these diamonds played a large part in Purdys history as they fully established us as the Canadian diamond dealer of the Kawarthas. After being in business 60 years, we thought it appropriate to pay homage to our 1944 heritage beginning. 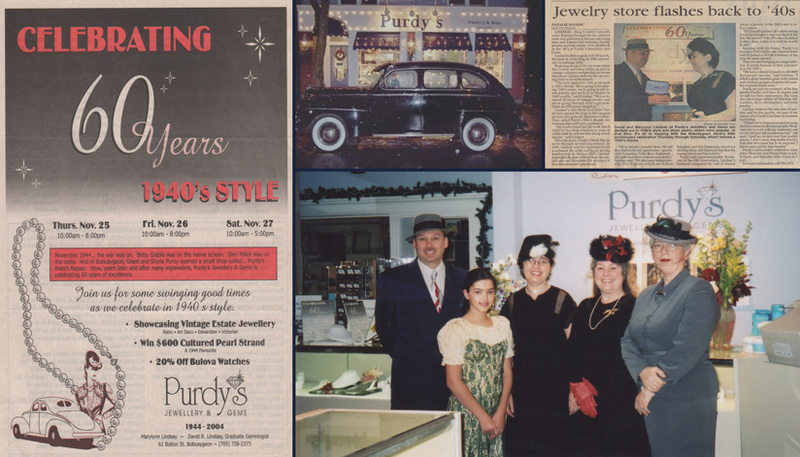 For our 60th anniversary celebration in 2004, Purdys Jewellery and Gems flashed back to the 1940s with our staff wearing original clothing from the era, played forties era music, showcased a classic car and served cocktails and canaps popular for the time. We also featured over 250 pieces of estate jewellery. Keeping with the theme, our Purdys soiree had a 1940s dollar sale with various items priced at $19.44 in honour of the year we opened. As pearls were an immensely popular fashion choice in the 40s, we also featured a large selection of pearl jewellery. 2009 Fast-forward 5 years to Purdys 65th Anniversary celebration with a sparkling diamond theme. Guests were welcomed with live music, wine, cheese and specialty hors-doeuvres. One lucky patron even went home with a $650 voucher to use toward a piece of diamond jewellery of their choice. 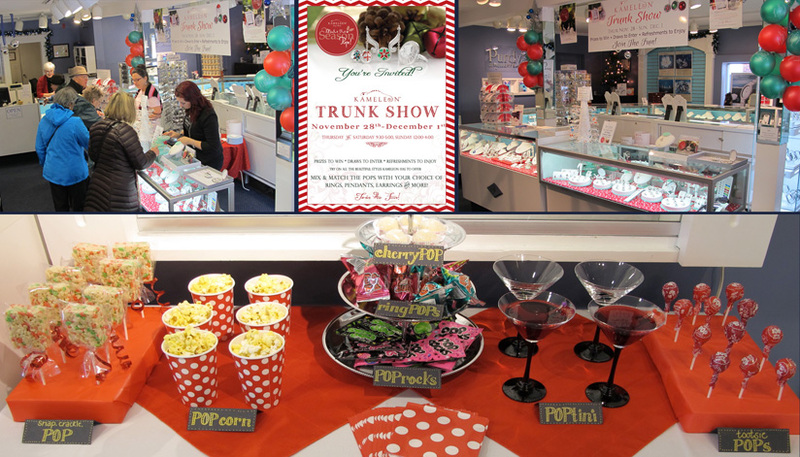 2010 In 2010, Purdys Jewellery and Gems introduced our outdoor boutique in the space adjacent to our store. These outdoor kiosks showcase affordable jewellery by local, national and international artists. We also showcase jewellery for children and men. 2011 The Gardner family has done all of Purdys fine jewellery repairs in their off-site shop since 1985. 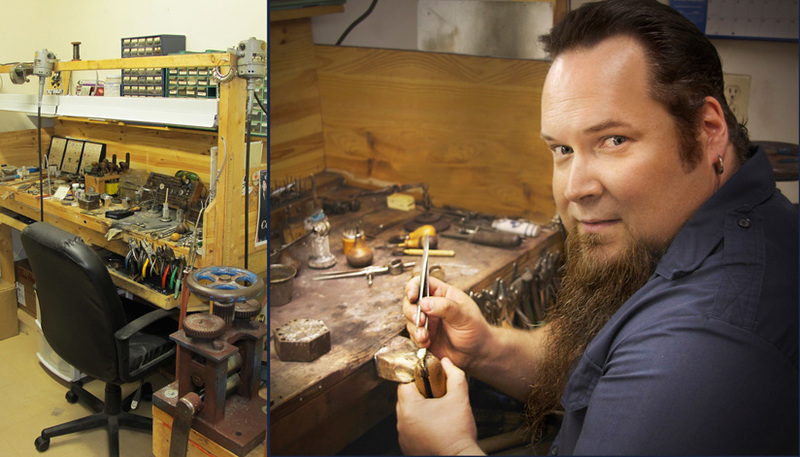 In 2011, we welcomed Doug Gardner, second-generation goldsmith, into our store as part of our team. Now with his workshop here, all fine jewellery repairs are done on site. Customers have peace of mind knowing that their valuables do not leave the premises. 2012 For decades, Midnight Madness has been a staple on the August long-weekend in downtown Bobcaygeon. 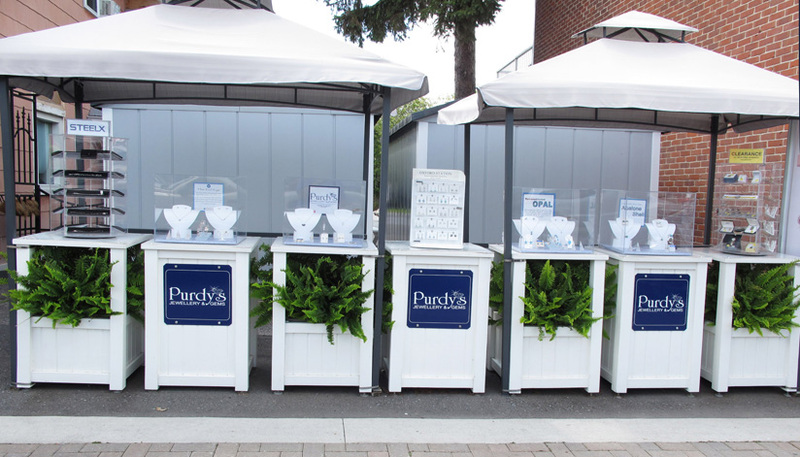 As such, Purdys has been a proud participant and contributor since the events creation in 1987. 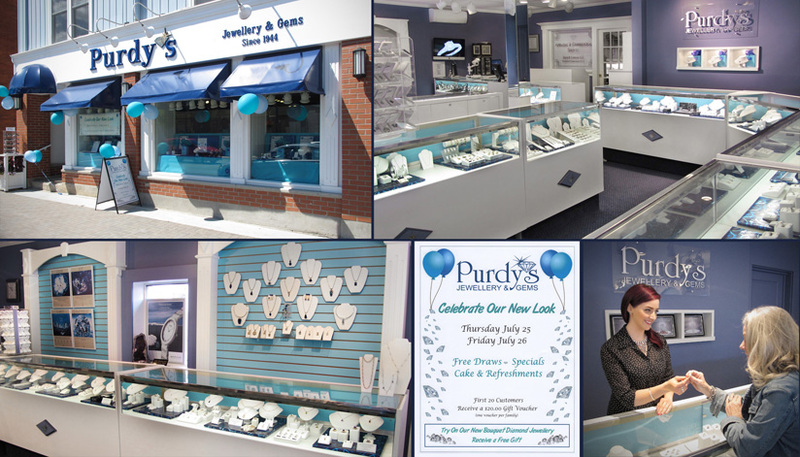 In the spring of 2013, Purdys Jewellery and Gems celebrated our new look after the completion of our latest renovation. We introduced our new deep blue and turquoise colour scheme along with several new brands including: Bouquet Diamond Jewellery, Kameleon, Persona, Steelx, Ethan Stars, Boma, Caravelle New York and Bering. At this time the Purdys team also grew to include Jen Dudman, our graphics and media expert. In the fall, Purdys hosted a Kameleon Trunk Show. We brought in extra Kameleon jewellery to launch the popular program. This exciting event gave our customers a chance to get to know the Kameleon brand of jewellery and experience how easy and fun it is to pop the different jewel pops creating endless ring and jewellery choices. Kameleon is a sterling silver jewellery line in which all the centre stones known as Jewel Pops can be removed and interchanged giving the piece, whether it be a ring, necklace, earrings or bracelet, an entirely new look! To play on the Jewel Pop theme, we served foods and beverages which featured the word Pop in the name. In addition, we gave away many Kameleon prizes in draws and games. 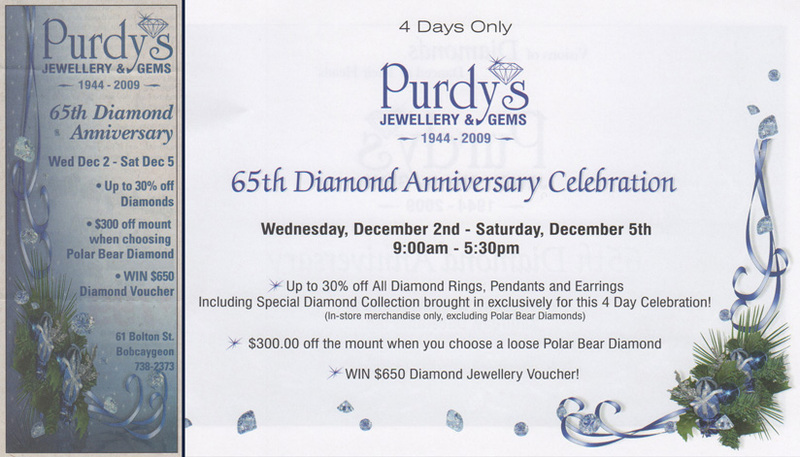 2014 November 2014 marked Purdys Jewellery and Gems 70th Anniversary. 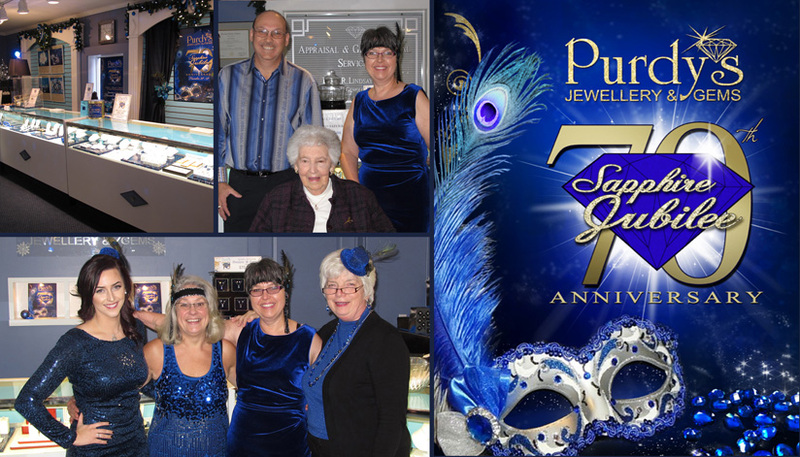 To celebrate, we held a dazzling Sapphire Jubilee event. To begin the festivities, we hosted a special VIP night and sent out exclusive invitations to our most faithful, long-time customers as a thankyou for their loyalty. The night included music, games, activities, food and refreshments. The event continued for 3 days where we showcased a large selection of loose sapphires and finished sapphire rings and jewellery of all colours of sapphire, blue being the most popular. As well, Purdys introduced our new line of Dancing Sapphire jewellery. These unique pieces have sapphires set in such a unique fashion that the sapphires move or dance as you move, constantly catching the light and sparkle. 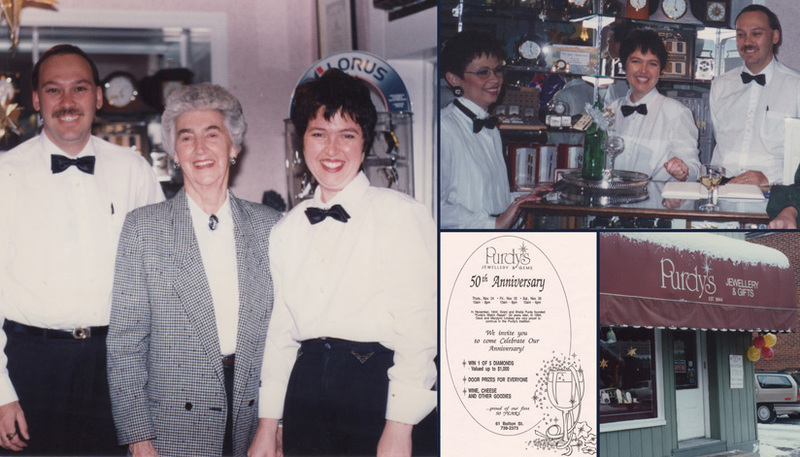 Aunt Sheila, our honoured guest, enjoyed talking to her customers from back in the day when she and her husband, Grant, owned Purdys Jewellery store.